If you want to know what is the best blender under $100 for your needs, you’ve come to the right place! An inexpensive one can work well for you in your kitchen, however, you need one that will do what you need it to do. Are you going to use it to prep food, make-frozen beverages, or will you use it to juice vegetables and make purees? You can easily whip up a batch of salsa, chop nuts or make a smoothie with a machine that has the power. Keeping your purchase under budget is easy as long as you know what features are available and which of those add to the cost. Let us help you sort them out so you can decide on your must haves. Capacity of the jar is usually between 4 and 8 cups and will be plastic, glass or stainless steel. If you’re looking to only make smoothies or shakes for just one person, try one of these personal blenders instead. A contoured jar may be easier to clean and creates a better vortex than a flat bottom. Easy to read measurement notches are nice to have so you eliminate the need for extra measuring cups. Does it come with a tamper and does it have a wide mouth for easy feeding of large pieces? While some blenders come with the basic 3 speeds, some go up to 16, which is really overkill for most cooks. Three speed options are perfectly fine for most blending jobs. In addition, a pulse setting is essential so you don’t risk over-processing certain ingredients. Wattage ranges from 300 to 1000 but higher wattage is not always the best for countertop blenders. If you have a higher budget for more powerful and versatile machines, we have chosen some great blenders that cost between $100 and $200. Detachable blades and touchpad controls are easy to clean, while attached blades, push buttons and dials are harder to clean. There are many products on the market, some with base mounted motors, and others with top mounted power heads. They are all designed to crush ice and blend fruits and vegetables. Whatever you use it for, any one of the following best blenders under $100 will help you with your kitchen creations. Note that if you want pure juice without pulp, these are not the appliances that will do that. A juicer is what you want. When making frozen drinks, smoothies, shakes and juicing vegetables you will need a blender with power and blades that easily crush ice. The Ninja Professional Blender provides the power to perform these heavy weight kitchen tasks and is probably the best blender for the money. The brawny 1,000-watt motor turns six stainless steel blades at 3 levels, and combined with Total Crushing technology it has the power to crush ice, whole fruits and vegetables quickly and into a smooth consistency. Quickly blend a batch of margaritas or smoothies for yourself or a crowd, as the BPA-free 72 oz. capacity of the pitcher is pretty large. The LED electronic controls panel gives you access to three speeds and a pulse function for complete control. Auto shut off promotes safety. One viewer claims that this Ninja has the power of a comparable, but more expensive, Vitamix and can even chop things and crush ice and frozen fruits fast. While a Vitamix pulverizes greens better for an ultra-smooth blend, you can get good results with this Ninja by scraping the ingredients down every now and then and maybe adding a little water to aid it. The ability to remove the blade assembly for cleaning was a feature that reviewers found convenient. Like the Ninja, the KitchenAid 5-Speed Blender is a traditional stand blender and uses a soft start feature that slowly draws in the added ingredients and then adjusts to the selected speed. The Intelli-Speed® Motor Control senses the contents and adjusts the speed for optimal performance of the blender. Five speeds give you the power control that you need for staggered blending tasks and the crushed ice feature pulses to give you perfect crushed ice every time. The Kitchen Aid 5-speed blender uses a 56 oz. BPA free, dishwasher safe plastic pitcher and is scratch proof, shatter resistant, and large enough to make several glasses at one time. Reviewers found the KitchenAid blender to be powerful with the ability to quickly crush ice or to whip up a batch of kale smoothies without leaving lumps. Many reviewers are purchasing this product to replace Kitchenaid units that they have had for years. Loyalty to a product indicates that they were happy the first go round. There are two complaints of this unit: One is that it is a bit noisy and the other is that the blades are attached to the inside of the jar, making cleaning a bit inconvenient. Note that if you like to juice tougher green vegetables or even wheatgrass, this is not the type of blender to do that. Instead, take a look at masticating juicers that chew fibers to extract just the juice from the vegetable. 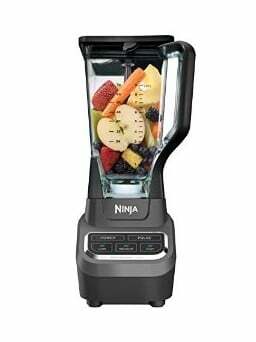 The Ninja Master Prep Professional has less power than the two preceding blenders using a 450-watt top mounted power pod as opposed to a powered base unit. However, what it lacks in power it makes up for in versatility. The Master Prep can mince, dice, blend, chop and puree your food into magnificent creations with effortless ease. Ice and frozen fruits are crushed in seconds. It comes with three BPA-free processing containers, which includes Ninja’s new 40 oz. processing bowl, a 16 oz. chopper bowl and a 48 oz. blending pitcher. Also included are blades, lids, spouts and splashguards for all three containers. The power pod can quickly be transferred to any of the 3 jars and it features a pulsing button so you can control blade speed. Reviewers love its versatility and ease of use but they say you have to be careful while cleaning the jars, as the blades are very sharp but not detachable. They also say that it is not good for making smoothies completely free of lumps, however, this blender combo is worth a look when searching for one of the best blenders under 100 dollars. A great little blender for personal use, the Cuisinart SmartPower comes with 15 pieces, including two high quality blade assemblies, and can be used to blend and chop produce for your favorite recipes. A sleek touchpad and LED screen makes it a nice addition to the kitchen counter. The powerful 350-watt motor in the stainless steel base of the unit is ample for the 32 oz. BPA-free ABS blender cup. It also comes with an 8 oz. chopper cup and four 16-oz. to-go cups so that you can take your special blend smoothie with you. You can even take it with you while traveling, provided you pack the blades in checked luggage if you fly. Safety interlock and Auto stop provide safe operation. High and low speed levels with pulse, give you flexibility when blending. Reviewers say that it has the power to grind coffee beans and crush ice and works well for pureeing vegetables, chopping nuts, and whipping cream. However, a few say that some of these tough jobs should not be done too frequently. They also like the compact size and ease of cleaning. Designed for smaller batches of beverages and light processing of fruits and vegetables, the SmartPower is perfect for one person or for a household where everyone wants a different beverage. The Oster two speed, six-cup glass jarred Beehive blender is a classic. Even though there’s nothing fancy about it, users swear by it. The 600-watt speed unit has ice-crushing power and uses a six-cup glass jar pitcher that is thermal shock tested to take extreme temperature variations. The stainless steel Ice Crusher blade gives you perfectly crushed ice, every time. Oster uses an all-metal drive that will provide long lasting durability. A removable see-through cap on the lid allows you to fill the jar easily and acts as a measuring cup too. The speed switch toggles between high and low. A big positive that’s missing from the other units is that the screw cap of the blade assembly will fit with many other jars, like others by Oster and even mason jars. Reviewers claim that it has the power to turn raw vegetables and fruits into smoothies with amazing ease. Other reviewers claim that it is on the upper side of loud, but had no complaints about its performance. Its quality of construction makes this unit a bargain if you are in the market for a new blender that’s made in the USA. Countertop blenders are great but if you need an appliance for quick and delicate jobs like pureeing soups or whipping eggs whites, you should look at immersion or hand blenders.